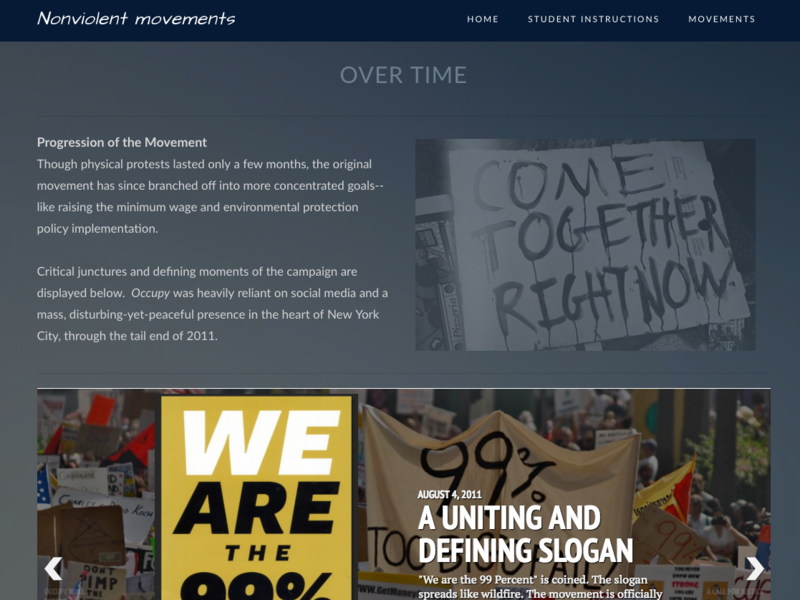 In this course, students are expected to analyze various types of social movements through a historical and anthropological lens, and devise their own arguments to answer why some nonviolent strategies work while others fail. Once they refine the skills of analyzing the movements through a methodical approach, students choose their own nonviolent movement to explore. Their first task is to map the chronological events and key data relating to their movement through a timeline or infographic. Next, they provide a reflection on the movements. Finally, students post their assets on a shared public course e-portfolio. As part of his work on the Faculty Learning Community, Elton Skendaj wanted students in his Nonviolent Movements course to create a public mixed media overview of one nonviolent movement. This assignment would challenge his students to rethink of their topic with various lenses: First, through a historical lens that breaks down the most significant events that led to and impacted the movement; Next through the chronological lens that pieces those events into a coherent timeline or infographic story. 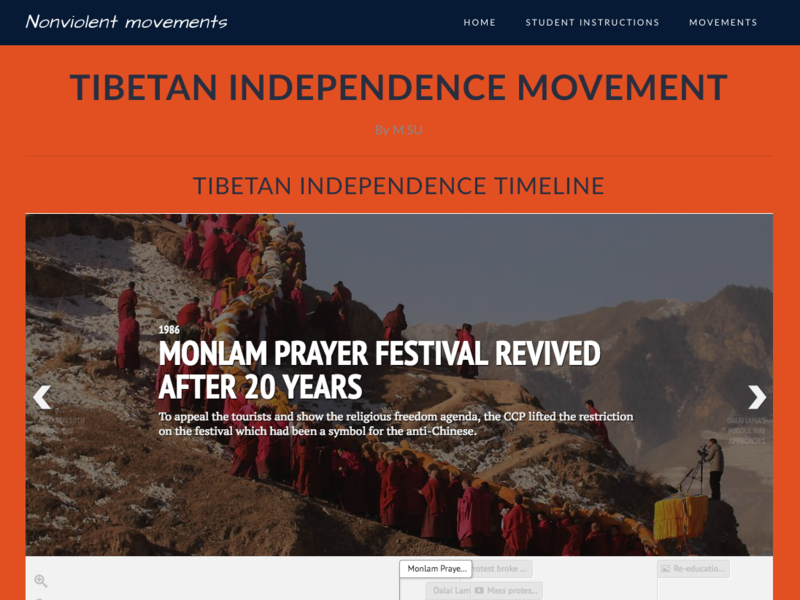 By displaying this information in a public course portfolio, students are now able to showcase their skills in analyzing historical movements while evaluating the causes and effects of these movements. Lastly, they will have practiced digital literacy skills in modeling good research practices and sourcing of information. These efforts are displayed publicly and can be shared with future employers or linked to a personal portfolio. Critical Thinking: Analyze the historical and political significance of a nonviolent movement. Digital Literacy: Evaluate sources of information, its reliability, and the relevance to the nonviolent movements. Reflect: Reflecting on the impact of the movement in order to assess its effectiveness. Guidance on the following implementation of these technologies was provided by Academic Technoloiges and the Digital Media Lab. Early on in the Faculty Learning Community sessions, Dr. Elton Skendaj was eager to employ digital portfolios as a method for sharing and community building within his course. He already had a framework for an essay assignment from the previous semester. Turning this assignment from an essay into a visual and mixed media project was a logical next step. Before choosing which platform or digital tools to use, he explored various options of e-portfolios, finally deciding on Weebly. He also wanted to incorporate a timeline or infographic to visually summarize the data on these social movements. Planning was essential. Using the help of an Instructional Designer, he began planning what the logistics of this project would entail. His students would need to propose their topics early on, the website needed to have a template for students to easily work on, and access to the course website needed to be granted early enough as to give students enough time to post their assets to the website. He also wanted to make time for students to work on their projects in class, using up one full class day for workshops and hands-on work. In addition to preparing for the technical requirements of this project, the academic areas of the project also needed to be scaffolded. This ensured the project would be completed on time and will gave him plenty of time to provide feedback to students as they worked. Students enjoyed working on their projects, feeling more acquainted with the subject matter than in past terms when employing solely essay assignments. One of key benefits was students learning from each other's work. Many said they enjoyed learning a new skill and the tools had relatively low learning curves. During live workshop days, he witnessed students providing feedback on design elements, such as font use or colors on their pages. From this course assignment, one student decided to apply for a PhD in political science in order to researh nonviolent movements. The following steps detail how to turn an essay based assignment into a mixed media course website assignment. Provide students instructions and rubric guidelines for their projects. Make sure project milestones are scaffolded throughout the term. Students submit a one-page proposal on their research question early on in the semester. Next, students complete their research and summarize key elements through a timeline or infographic. Soon after, a reflection is due. These items should be due more than halfway through the term. Students start compiling their assets into the course website, choosing the right design to present their information. At this point, you may host an in-class workshop to allow students time to work together and ask for feedback to their peers. Set a due date for website revisions, then revoke access after the deadline. Finally, have students present their webpages in class (optional). Consider that some students will not want to display their name publicly on a website due to privacy concerns. The proposal at the beginning of the term can help determine student submissions when it is time to grade.